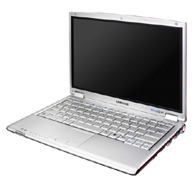 Samsung Q30 or Samsung NP-Q30 Intel Centrino notebook computer is a thin and slim laptop weighing 1.1kg and features low voltage Intel Centrino PM 1.1 GHz CPU, 512MB DDR RAM, 12.1″ WXGA TFT, 40GB HDD, integrated Wi-Fi and Memory Stick/Memory Stick Pro, SD, MMC Reader. TrustedReviews reviewed Samsung Q30 notebook and concluded that if you’re looking for a very light and slim notebook to carry around with you all day, every day, you’d be hard pushed to find a better unit than the Samsung Q30. Just make sure that you don’t need PC Card or Bluetooth support. At last, the Sony VAIO X505 has finally got some seriously stylish competition. The rating for Samsung Q30 is 8 out of 10.